Invisalign is the invisible way to straighten teeth without braces. Using latest CADCAM technology, a series of custom-made, clear trays (know as aligners) are produced. Each aligner moves teeth incrementally and is worn for a period of two to three weeks. 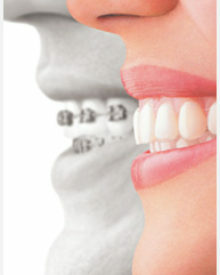 These series of clear, removable clear aligners gradually straighten teeth, without metal or wires. Invisalign is removable. Unlike braces, you can eat and drink what you want during treatment. Good oral hygiene can also be maintained because you can brush and floss normally. Invisalign uses high tech 3-D computer imaging technology that allows you to view your own virtual treatment plan before you start—so you can see how your straight teeth will look when your treatment is complete. Braces have become less bulky and visible in recent years, with more and more adults are wearing them, for a variety of reasons. Some adults want to correct problems with their teeth or jaws before they cause serious or further damage. Others want to feel better about their appearance by addressing longstanding cosmetic concerns. Keep in mind that even "cosmetic" problems can cause real damage over time. Teeth and jaws that are not aligned properly can lead to premature wear and tear, advanced tooth decay and gum disease, dentures or other reconstructive solutions and even more extensive surgery to correct serious problems. Copyright © 2019 Browns Bay Dental Centre. All rights reserved. Website by Harper Digital.